Dec. 5, 2011, 4:45 p.m.
By Megan Garber @megangarber Dec. 5, 2011, 4:45 p.m.
Today — an unassuming Monday after a relatively slow news weekend — is Buzzfeed’s biggest traffic day. Ever. Part of that isn’t too surprising. Buzzfeed’s traffic, says its founder, Jonah Peretti, has been trending upward, benefitting from the overall increase in the user bases of Facebook, Twitter, StumbleUpon, and other social platforms. Buzzfeed currently gets about 55 percent of its traffic from social sources, Peretti told me — and that percentage itself, especially over the last few months, has been steadily growing. “The world is shifting toward social content,” he notes, and since social content is what Buzzfeed’s all about, it’s been seeing the benefits of that shift. So today’s record traffic is in part a function of that overall growth. But it’s also the product of one specific post: “The Most Powerful Photos of 2011.” The feature, posted two days ago, has (so far) garnered over 3 million views — almost all of them “viral views,” or views that come from social networks and aggregators. The post, created by BuzzFeed editor Matt Stopera, has been tweeted over 22,000 times; it’s been liked on Facebook over 130,000 times. It’s gotten nearly 2 million referrals from Facebook, nearly 250,000 from Reddit, and nearly 90,000 from Twitter. And “it’s still going strong,” Peretti says. Which begs the question: Why? What about this post, in particular, gives it its impressive virality? The broad answer is that “The 45 Most Powerful” offers a seamless mix of information and emotion. As a work of journalism, it serves as a nice reminder of the big news stories of 2011: Japan’s earthquake, London’s riots, Osama bin Laden’s death. Like any good “year in review”-type feature, it combines an informational approach to the events of the past year with the emotional, marrying memory with something even more powerful: nostalgia. The fact that it’s comprised mostly of images (as the post’s name suggests, particularly powerful images) gives it a gut-level relevance — and a relevance, significantly, that persists despite users’ age or language or location. It gets you in the head and the heart at the same time. There’s also the fact, of course, that the post is a composite of 45 different, and topically varied, photos. It’s not a slideshow — the images live together at the same URL, with nary a pagebreak in sight — but each picture increases the chance of the kind of social relevance that encourages sharing. I might not connect personally with photos of, say, the U.S. war in Afghanistan; but I might know one of the protestors who was pepper-sprayed at UC Davis last month. And I might share the post because of that connection. To Buzzfeed, as far as engagement stats go, the why of my share doesn’t much matter: A view is a view. POSTED Dec. 5, 2011, 4:45 p.m.
Garber, Megan. "How Buzzfeed got its biggest traffic day…ever." Nieman Journalism Lab. Nieman Foundation for Journalism at Harvard, 5 Dec. 2011. Web. 18 Apr. 2019. Garber, Megan. 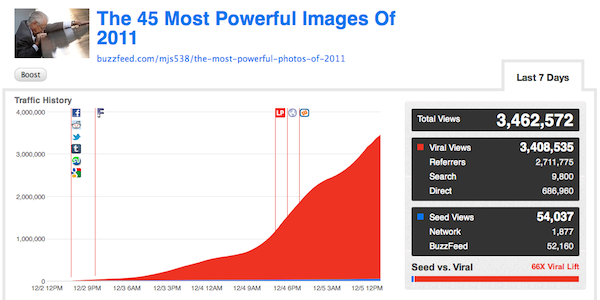 "How Buzzfeed got its biggest traffic day…ever." Nieman Journalism Lab. Last modified December 5, 2011. Accessed April 18, 2019. https://www.niemanlab.org/2011/12/how-buzzfeed-got-its-biggest-traffic-day-ever/.